PHOTOS: 33 Rescued Circus Lions Airlifted From Peru To South Africa : The Two-Way The organizers are calling it the "largest airlift of lions in history." The animals were rescued from circuses after Colombia and Peru banned the use of wild animals in circuses. 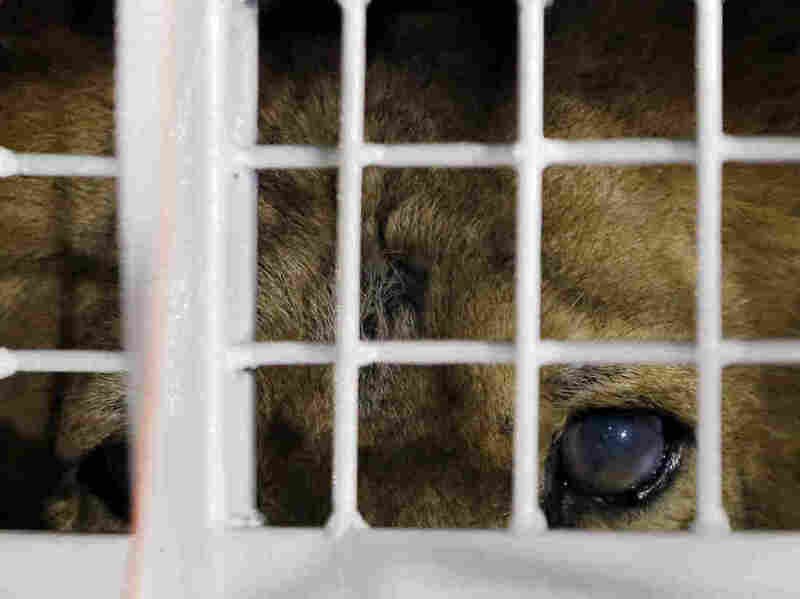 A former circus lion peers from inside a cage during their arrival at OR Tambo International airport in Johannesburg, South Africa, on Saturday. 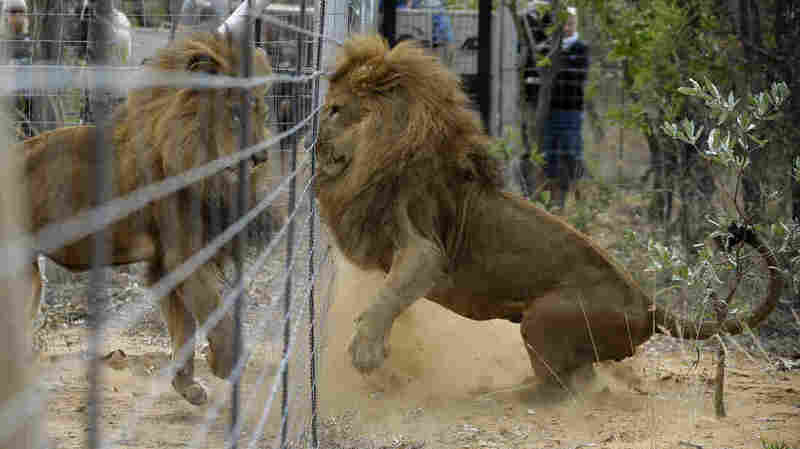 33 lions have been rescued from circuses in South America and airlifted to a wildlife sanctuary in South Africa. 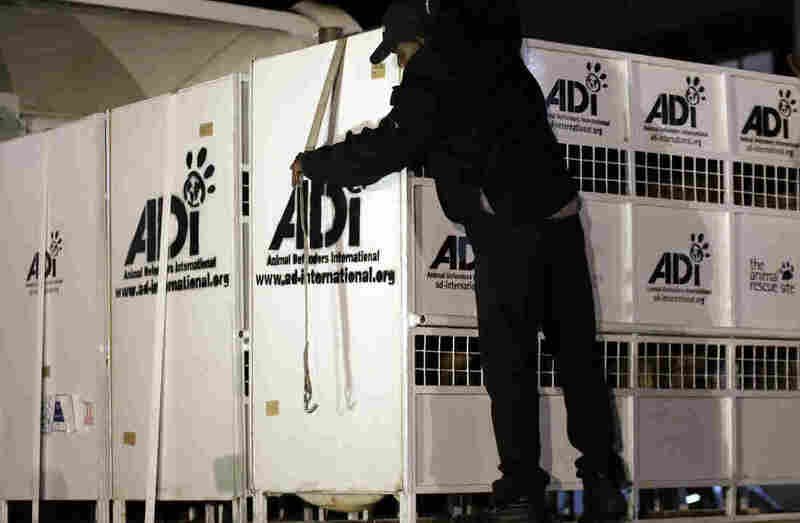 The group that organized the operation, Animal Defenders International, is calling it the "largest airlift of lions in history," The Associated Press reports. The US-based group says 24 of the lions were rescued during surprise raids on Peruvian circuses, while nine were "voluntarily surrendered" by a Colombian circus. They were in bad shape: "Almost all of the rescued lions have been mutilated to remove their claws, one has lost an eye, another is almost blind, and many have smashed and broken teeth so would not survive in the wild." "Their forever homes will have acres of natural bush (a separate habitat for each family or pair) with watering holes, platforms, trees, vegetation all safely secure behind double electric fencing (outside is included to prevent access by other animals)." "The lions are returning to where they belong," sanctuary founder Savannah Heuser says in a statement. "This is their birth right. African sun, African night skies, African bush and sounds, clouds, summer thunderstorms, large enclosures in a natural setting where they can remember who they are." ADI says the group consists of "two large family prides, several pairs and some who will be introduced to see whether they would form a family," and the group will likely need "at least 10 or 12 separate habitats." Photos released on Sunday showed the big cats taking their first steps into their new home. Their habitats will be expanded in the coming months, as the lions get used to their new environment. The lions are incapable of hunting due to their physical condition, according to the wire service, and "will have to be cared for with food and water for the rest of their lives." 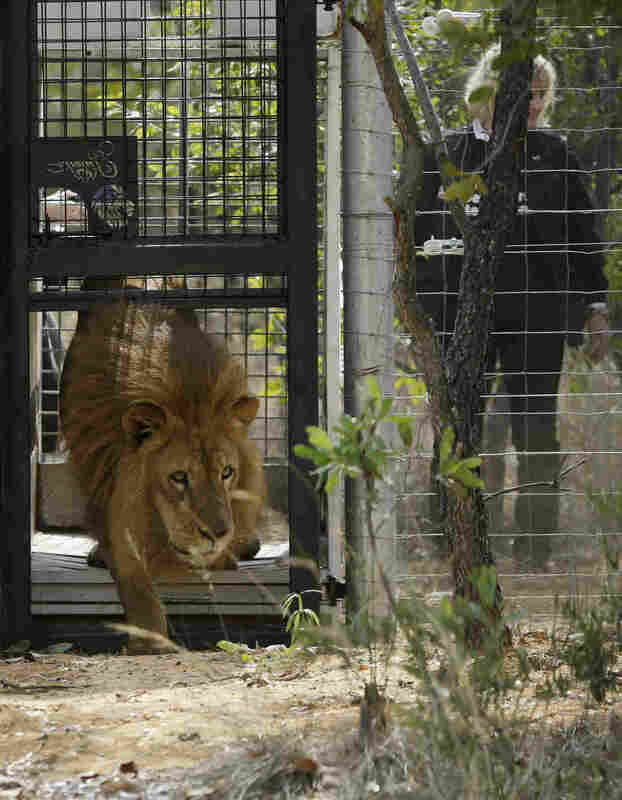 Former circus lions plays after being released into an enclosure at Emoya Big Cat Sanctuary. "ZEUS: Zeus may look a little grumpy but he's actually a lovely lion, and so serene – until cleaning time that is, when he tries to bite the water jets! He's also a super snorer, though that doesn't seem to bother his neighbours much! "LEO: Leo is the granddaddy and one of the oldest lions rescued by ADI during Operation Spirit of Freedom. He has a very charming personality and is rather friendly with the much younger Rapunzel who lives next door. Although he doesn't have many useful teeth left he loves playing with and popping soccer balls, even though it takes him a little longer than the younger lions. "MAHLA: Mahla lives with mom Kiara and brother Scarc, who she likes to boss around! The young pair play chase and go absolutely wild for fast toys, with cat nip balls being their favourite. ADI tweeted a photo of Iron, the first to be released. According to his profile, Iron seems to have been craving open spaces — "he can often be seen 'running' in his sleep."